The feud between these TV news titans came to a head on June 1, 2009. The previous day, Dr. George Tiller, who O’Reilly had stigmatized for years as “Tiller the baby killer” because he was one of the few doctors who provided late-term abortions, was shot to death at his Lutheran church by an anti-abortion fanatic. At the same time, Keith Olbermann was dealing with the situation in his own way. He made his most bitter attack against O’Reilly and FOX News yet, accusing them of responsibility for Tiller’s death, and declared that FOX News needed to be subjected to a “quarantine”. Thus, he made the decision to retire his mocking of O’Reilly, merely being content to quote his words. Frankly, I would have done the same. The whole situation was just too disgusting to make fun of. 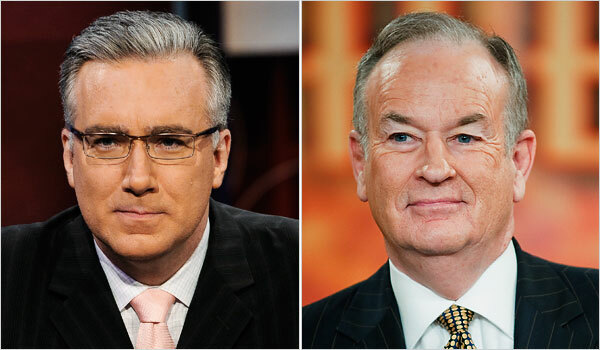 Keith Olbermann of MSNBC Bill O’Reilly of the Fox News Channel regularly trade swipes at each other on their cable news shows. He must have been furious! Had he kept his word and never made fun of Bill O’Reilly again, it would have made him look like a corporate shill, not a legitimate newsman. So in this case, he had to break his word in order to preserve his credibility! So now, I have just one question: Has Brian Stelter been fired from the New York Times yet? Oh and by the way, Keith Olbermann would not need to do damage control if someone was insane enough to kill Bill O’Reilly. He already denounced one such threat made against his rival on August 19, 2008. That’s right, ONE YEAR AGO! And that’s why Olbermann is the better man. This entry was posted in honor, justice, news media and tagged Bill O'Reilly, enemies, FOX News, Keith Olbermann, MSNBC. Bookmark the permalink.